Once you’ve invested in interior graphics for your business you want to make sure that they last for a long time. 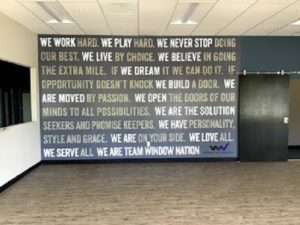 With the proper care graphics like wall and floor wraps as well as window graphics will look nice for years. Her are a few things that you can do. There will be very little to do to keep your wall graphics looking nice. If you want, you can dust them off occasionally by wiping them with a dry microfiber cloth. But otherwise, wall graphics are designed to fit seamlessly to your wall. As long as you are careful not to bang or scuff the wall, which is the same precautions you would take anyway for a regular paint job, then the wall graphics should be able to last for a really long time. These are the most durable and require very little maintenance. The main thing to consider is that if your floor needs to be cleaned by buffing then you should apply some floor wax over the graphic to prevent it wearing off. Contact Brand It Wrap It Today! If you are looking for a cool custom way to decorate your vehicle or advertise your business, make sure to check out Brand It, Wrap It, Custom Signs and Vehicle Graphics. We are a full-service sign and wrap company that provides excellent quality signage for businesses both big and small throughout the Maryland, Virginia, and Washington, D.C. metro area. We provide awesome customer service, use the best and latest sign printing technology, and pride ourselves on our attention to detail. To see how we can help your business shine, give us a call at 301-838-9727 or visit us online for an estimate. For more tips and articles like this, follow us on Facebook, Twitter, Google+, Pinterest, and Instagram. This entry was posted on Monday, March 18th, 2019 at 11:29 am. Both comments and pings are currently closed.